Sean Andrish set the record in April 2005, 3d16h8m. The Tuscarora Trail is a rugged, 250-mile long side trail of the Appalachian Trail though portions of Pennsylvania, Maryland, West Virginia and Virginia. The southern terminous is in Shenandoah National Park. 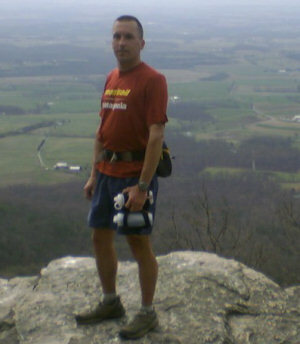 It was first done as a speed run (ultrarunner style) on March 9-13, 2000, by Joe Clapper. Joe finished the route in 3d22h27m, as reported here. In April 2005, Sean Andrish beat Joe's time by about 6 hours, as reported here. Joe Clapper and David Horton organized a 6-day stage race of the TT in March of 2003. The race, held in difficult conditions due to deep snow on sections of the trail, and exceptionally bad weather on the fourth day, had 20 starters and 6 finishers. The entry fee for this insane, 6-day, 250-mile event was just $75 (which included a T-shirt)! Revival of the race has been discussed, but no one has managed to pull it off. Any word on anyone ever attempting an unsupported or self-supported record?